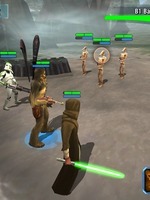 Star Wars Galaxy of Heroes will take you to a remarkable intergalactic adventure that every Star Wars fan will enjoy. A game that will turn all your Star Wars fantasies come true as this game will merge every Star Wars films from the original trilogy down to the current Anthology films. It will introduce all your favorite characters from the franchise including Han Solo, Chewbacca, Princess Leia, Yoda, C-3PO, Luke Skywalker, Darth Vader and many more. It may not be part of the real timeline but it’s definitely the greatest Star Wars universe crossover! If you are a big fan, feel free to download Star Wars Galaxy of Heroes and let an epic intergalactic journey begins. Interestingly, Star Wars Galaxy of Heroes is a unique game of its own. It’s a role playing game and a card game at the same time. It’s more like a fictional game within a fictional universe. The game introduces you to holotables where the actual journey will take place. Holotable is a device that projects holograms above its surface which means you are not really playing the actual characters but a virtual and hologram version of themselves. To start, players will use data cards to unlock heroes. There are over 140 characters to unlock which also includes iconic battleships like Starfighters and the Millennium Falcon. 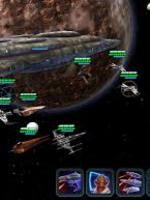 The main objective in this game is to become the master of the galaxy. Build your own troops of heroes and enter a series of challenging battles with varying range of difficulties. Players can build their own ultimate team of Star Wars heroes regardless of which side are you in. You can be part of the Rebel Leaders or join the Imperial Star Wars. The game takes you to different battle campaigns including the Light and Dark Side battles, Squad Arena and epic Ship battles where you take control of the Star Wars iconic battleships. To top it all, you can also join guilds along with other players or better yet create one your own. Appearance wise, Star Wars Galaxy of Heroes is a true visual delight adorned with wonderful details and animation. Good luck and may the Force be with you! Download Star Wars: Galaxy of Heroes for Android or iOS below. These links will take you to the respective app store to download the app to your device. If available, you can also choose to download the .apk file to install on your Android device. Please note that the app may request extra permissions, or contain in-app purchases.